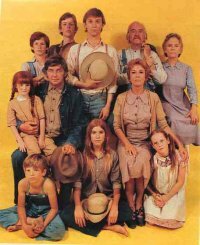 The Walton family pose as they appeared when The Waltons first premiered on CBS in 1971. Sam Holden Jack Ripley The Carnival s1/e2. Homer Ferguson Arthur Peterson The Carnival s1/e2. Frank (unknown) The Reunion s1/e13. Favorite gun is a "22"
His milk cow is named "Bay"
Family moved from Rutgersville after father found work in Norfolk. Elizabeth and Aimee both like him s6/e16. In high school yearbook, voted as "biggest bull shooter"
Olivia mentioned to Mary Ellen that Juanita Simons once dyed her hair and it turned "green as grass"
Dr. McIvers Rance Howard The Gift s2/e18. His puppy is named Fibber, from Charity's litter. Traded John-Boy his car for work around his house. The representative in the Virginia legislature that represent the mountain people near Martha Corinne in Blue Rock Creek. Jason tells John-Boy he is interested in asking her out on a date. Proposed to by Bertram when Esther said no to his first marriage proposal. Mother Mrs. Garner who lives in Lynchburg s6/e21. Introduces Jason and Sally Ann as they sing a duet of a song that Jason wrote and composed "Will You Be Mine?" The boy who left books at the Walton house. Erin wants John-Boy to return the books to the boy's house. Schoolgirl who sings with Jason on song "Will You Be Mine?" In high school yearbook, voted as "biggest heartbreaker boy"
NOTE: In The Fire (1/16) the character Lutie Bascomb may be the same man as Lair Basham. Daughter of owner of Jarvis Used Car Lot. Owner of Guthrie Coal Mine Company. Died on troop ship traveling to England. Gave her 4-H project pig Jay-Bez s6/e22. Old woman in the Mountains. Also appeared as man who buys John-Boy's Meadow s?/e? ; and appeared as man who gives John a lumber contract s/?e?. Could this actor be a relative of Mary McDonough?